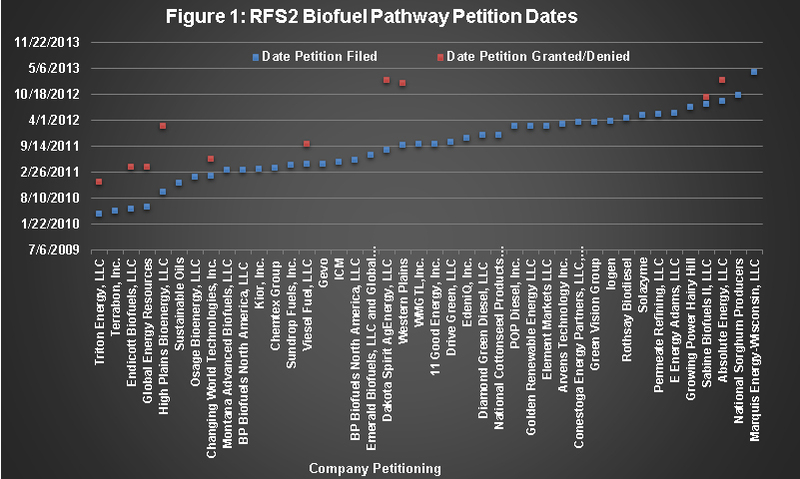 EPA Biofuel Pathways and Petitions: Failure to Launch? In 2007, the Energy Independence and Security Act (EISA)i revised the federal renewable fuel standard (RFS2), by expanding, among other requirements, the mandate for next-generation ethanol.ii The Environmental Protection Agency (EPA) oversees implementation of RFS2, including approval of biofuel pathway petitions for new feedstocks such as camelina (Camelina sativa) oil and energy cane (generally a hybrid of Saccharum officinarum and Saccharum spontaneum, but other hybrids have been used such as Saccharum barberi and Saccharum sinense, in the development of new cultivars).iii To date, EPA has approved 10 of the 42 petitions it has received for new biofuel pathway determinations, with an average waiting time of 1.37 years. Although Congress passed EISA in 2007, RFS2 regulations did not officially take effect until July 1, 2010.ix Since RFS2’s implementation, 42 companies have petitioned EPA for approval of their non-modeled pathway.x (See figure 1.) Interestingly, only 10 companies have actually received a disposition on their petition, less than 25 percent.xi (See figures 1 and 2.) 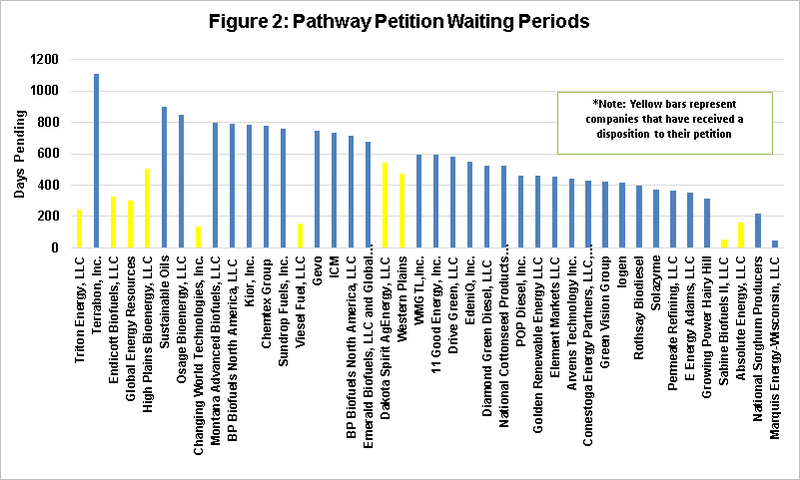 The average waiting time without a disposition on a biofuel producer’s pathway petition to EPA exceeds more than 1.37 years.xii The longest pending petition has been sitting in limbo for almost three and a half years, while the shortest timeframe for a pathway approval was less than 60 days. (Figure 2.) The average wait time for a company that has been approved for a new biofuel pathway has been 290 days. For those companies that are still waiting for a determination from EPA, however, the average wait time exceeds 570 days – nearly twice as long. The length of time between filing of the petition and final determination suggests that there may be a lack of transparency and clarity of the data EPA needs to conduct its assessment, especially for petitions involving substances or processes other than biodiesel or corn ethanol. For example, in their rulemaking procedures it is clear that EPA does not formally address feedstock invasiveness,xiii which for at least one company stands as a direct impediment to their pending biofuel pathway petition.xiv As EPA continues to move forward with implementing RFS2, it is essential that the agency develops clear guidance on the pathway approval process, including procedures to address relevant matters outside the GHG balance equation, such as invasiveness. Minimizing these regulatory hurdles through increased transparency could better enable the nascent advanced biofuel industry to meet the RFS2 mandates. i Pub. L. No. 110-140, § 202 121 Stat. 1492, 1521, (2007) (originally codified at 42 U.S.C. § 7545(o)(2)). ii 40 C.F.R. § 80.1416.
iii 78 Fed. Reg. 14201 (March 5, 2013). vi Guidance on the Petition Process for Evaluation of New Renewable Fuels and Pathways under 40 CFR 80.1416, EPA, http://www.epa.gov/otaq/fuels/renewablefuels/compliancehelp/lca-petition-instructions.htm. ix Questions and Answers on Changes to the Renewable Fuel Standard Program (RFS2), EPA, http://www.epa.gov/otaq/fuels/renewablefuels/compliancehelp/rfs2-aq.htm. x Guidance on New Fuel Pathway Approval Process, EPA, http://www.epa.gov/otaq/fuels/renewablefuels/compliancehelp/rfs2-lca-pathways.htm. xii EPA does not provide the date of petitions on its website, but the authors have received that information through Freedom of Information Act requests to EPA. The dates are available at https://foiaonline.regulations.gov/foia/action/public/view/record?objectId=090004d28006d677. xiii See, e.g., 77 Fed. Reg. 13009 (Mar. 5, 2012). What Price of Corn is Required to Make E85 Competitive?